God didn’t place you or me where we are so we could eat figs all day or post pictures on social media. To miss a kingdom assignment because we’ve become too caught up in our personal kingdom is one of the greatest tragedies we can ever face. But what did this phrase really mean? When we look at the life of Esther throughout the book titled in her name, this phrase actually refers to Esther being scolded for her self-indulgent, self-preserving mindset. In today’s language, we might call that being “shot down” for having narcissistic tendencies! Mordecai reproved Esther for living large and embracing royalty over righteousness — selfies over service. Through those telling words, he reminded her she had been chosen to set her own interests aside, let go of her own ambitions, and face an enemy full-on. She was to risk her life and her legacy with no guarantees of a positive outcome. That’s the “for such a time as this” Mordecai challenged Esther to accept. And that’s the “for such a time as this” God also sets before you and me. God has given each of us a job, position, resources, education and more. God has opened opportunities to optimize His kingdom purposes. He didn’t place you or me where we are so we could eat figs all day long or post pictures on social media. He’s placed us wherever we are because we are in the midst of a battle, a war. You and I are in the midst of a seismic conflict involving good versus evil. To miss a kingdom assignment because we’ve become too caught up in our personal kingdom is one of the greatest tragedies we could ever face. An entire nation was grateful for how Esther responded to Mordecai’s rebuke. Their lives were spared. How many souls can be spared in the culture where we live today when we choose to step up to service, even if it involves sacrifice? Lord, turn my heart and my mind toward You and toward the role You have chosen for me to live out. Help me to put Your will and Your purpose ahead of my own. I humbly bow before You and ask for Your direction and guidance, as well as Your courage to live out the calling I’ve been given for such a time as this. In Jesus’ Name, Amen. God has a purpose for your life, and every action or event has been used to make that purpose a reality. In Dr. Tony Evans’ brand new book, Pathways: From Providence to Purpose, Dr. Evans brings the story of Esther to life. Initially, Esther’s life appears to be a series of coincidences strung together to deliver the Jews from certain death. However, God selected Esther for a particular purpose at a particular time. Discover your own pathway to purpose and learn principles on providence as you experience a journey of epic proportions. 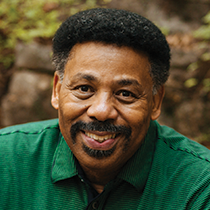 To experience more of Dr. Evans’ teachings and ministry, visit tonyevans.org. What are some ways the Lord is asking you to sacrifice on behalf of His purposes or serving others? What’s one step you can take to move more fully into His calling of surrender to Him on behalf of His greater plan? © 2019 by Dr. Tony Evans. All rights reserved.